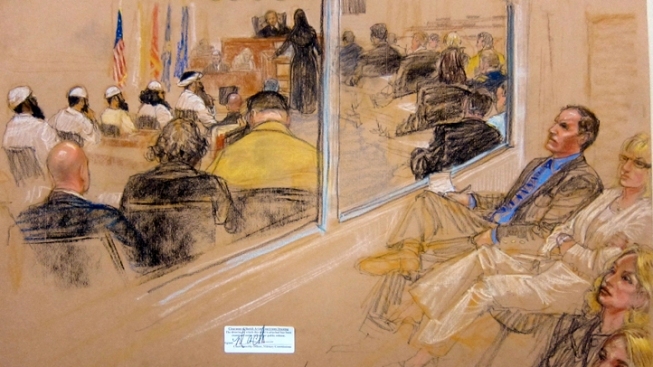 A judge ruled accused terror mastermind Khalid Sheik Mohammed will be allowed to wear camouflage during his trial on charges he helped orchestrate the Sept. 11, 2001 attacks. Mohammed and one of his co-defendants, Walid bin Attash, had wanted to wear camouflage clothing in the courtroom at their May arraignment, apparently to portray themselves as soldiers, but the prison commander refused to allow it. The judge ruled at a pre-trial hearing Tuesday they could wear some camouflage items as long as they were not U.S. military uniforms. Mohammed wants to dress like a "prisoner of war," said his lawyer, Army Capt. Jason Wright, and should be allowed to "wear the same type of uniform he wore while fighting for the U.S.-supported Mujahedeen in Afghanistan and in Bosnia," he said. Defense lawyers have said that the clothing restrictions had been a factor that led to their protest at their May arraignment, when the men ignored the judge's questions and wouldn't use the court's translation system. This week, the men have all appeared in traditional loose fitting traditional tunics, vests and hats that they chose to wear. Three of the defendants took the judge up on his offer to let them skip their military tribunal Tuesday and the proceedings went on without them. Mohammed was not in the courtroom while attorneys delved into a dense debate on legal motions, including rules for handling classified evidence at trial and what kind of clothing would be allowed. The 47-year-old Mohammed, who has previously said he conceived and orchestrated the Sept. 11 attacks, gave no reason for sitting out the hearing. But on Monday, he dismissed the military tribunal with scorn, saying "I don't think there is any justice in this court." Authorities have portrayed the other defendants as Mohammed's underlings, who provided logistical and other help to the Sept. 11 hijackers. All five face the same charges, which include terrorism and murder, in what is considered one of the most significant terror prosecutions in U.S. history. They all could get the death penalty if convicted at a trial that is at least a year away.